This past week in college football 7 teams from the top 25 lost. That is the more than any other week this year. It was the kind of week you would rather not be favored in. Utah shocked the world by stunning the number 5 ranked Stanford Cardinal by 6 points. On Saturday, October 12th the number 6th team ranked in the state of Illinois, Benet Academy, traveled to LaGrange Park to take on the Nazareth Roadrunners. 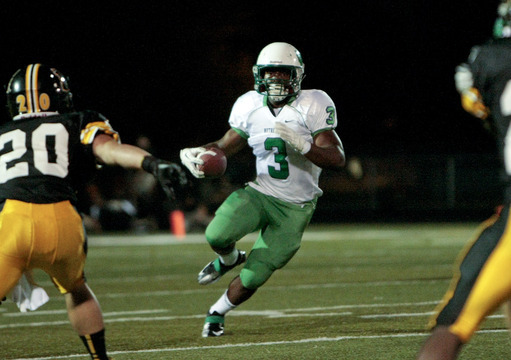 The previous week NAZ had knocked off undefeated Notre Dame which has the explosive Illinois halfback, Chris James. Most people thought it was very unlikely that they would upset ESCC power house Benet. What were the odds? Jack Beneventi and his Redwings were on a role with 6-0 record and 3-0 conference record. Their conference rivals, the Roadrunners from Nazareth, were playing with a chip on their shoulders. This was one of the best football games I have ever been to in my life. It was a thriller, trust me. Benet took a quick 3-0 lead on their first drive. The Roadrunners responded with a field goal of their own. Shortly after that NAZ stole the lead and was up 17-3 because of a blocked punt that was taken to the 5 yard line and an interception by Jack Dolan which he powered through to the 1 yard line. Both of those huge plays ended up with Ivory Kelly-Martin running it in for a Roadrunner touch down. The Benet fans and players didn’t know what hit them. At half the score was Bennet 6 Nazareth 17, but the Redwings superstar QB Jack Beneventi was determined to have a 2nd half comeback. The Redwings came storming out of the gates in the 3rd quarter and as expected roared back to a 18-17 lead over the Road Runners. At this point everyone was probably thinking that this was when Benet would run away with. I mean there is no way Nazareth could win right? WRONG! NAZ’s defense owned the fourth quarter. Beneventi and his ESCC top offense was trapped deep in its own end most of the period. 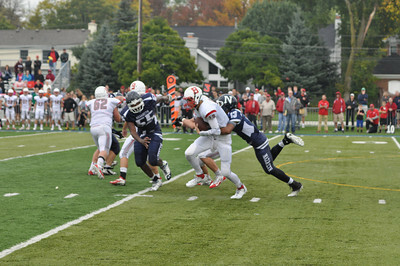 The suffocating defense of NAZ dominated the game. In the middle of the 4th quarter Carson Bartels the younger brother of starting QB Jake Bartels threw a beautiful touchdown pass to his fellow Sophomore Julian Love for a 25-18 Naz lead. On the ensuing Benet possession Beneventi was picked off by Dex Kelly-Martin. 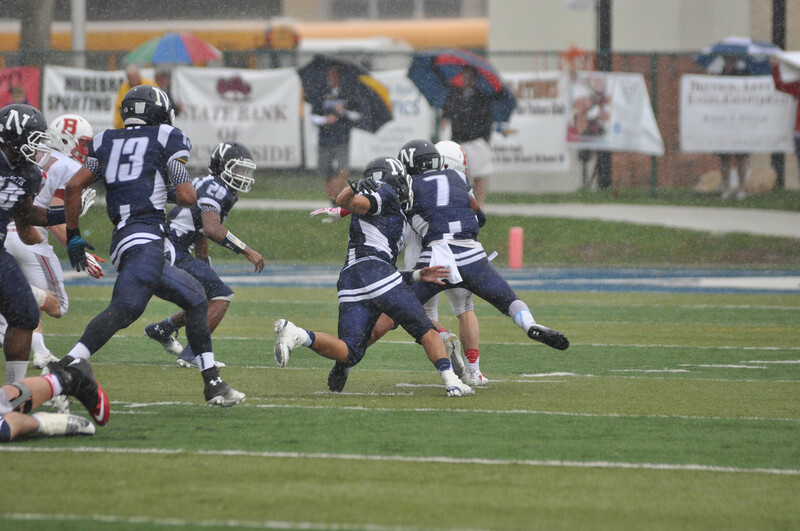 This led to the game sealing field goal by Nazareth’s Michael Hillsmen. NAZ led 28-18 with 1:30 left in the game. 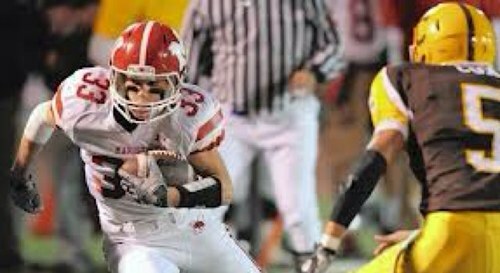 The Redwings were stopped on 4th down and all NAZ had to do was knee the ball. As the clock clicked zero the roaring crowed stormed the field. The Nazareth seniors were on the ground with tears of joy. It was truly a special game and a signature win for head coach Tim Racki. 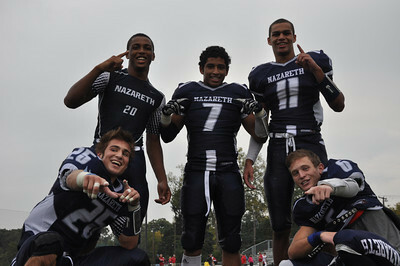 The Nazareth defense was a strong force in securing this win. I think this is the best defense in the ESCC conference which is loaded with high powered offenses and D1 talent. 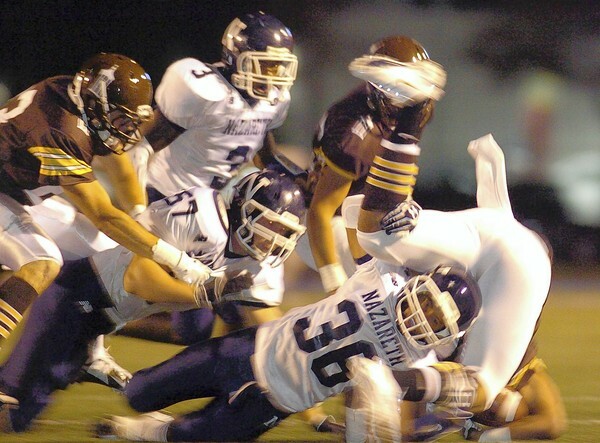 Nazareth may very well be the best defense in the state of Illinois. Why are they are so good? Because they never give you any breathing room. The receivers are always covered tightly and they can also stop the run. The last two weeks they played Chris James the best running back in the state and Jack Beneventi the best quarterback in the state. Both had zero touchdowns and fewer than 100 yards. This NAZ defense is fast and relentless. They play with speed, heart and soul. Key players on the Naz defense are Robbie Brindley, Jack Dolan, Doug DiFusco, Kevin Jackson, Dex Martin-Kelly, Danny Bakovich, Julian Love and the big men in the trenches, Michael Stec, Dimitri Joe and Will Colmery. They and their defensive teammates are creating a season to remember and possibly a deep playoff run. 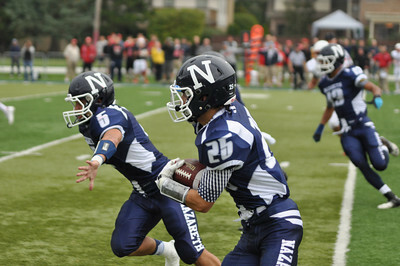 Keep your eye on the Nazareth Academy Roadrunners. James is probably the biggest name in the toughest conference in Illinois and he is also the favorite to win this award. James is a small back at 5 foot 9 but he can sure put on the wheels and race to the end zone. This speedy back lights up recruiters eyes. He already has offers from Arizona State, Georgia Tech, Idaho, Illinois, Indiana, Iowa, Michigan State, Minnesota, Nebraska, Northern Illinois, Pittsburgh, Syracuse, Tennessee, Toledo, Western Michigan, and Wisconsin. He is not all speed, Chris James is 202 lbs of pure muscle. He has the jets to turn on and he can power through almost any defender, “almost”. The only down game he had was against Nazareth Academy lockdown defense and their hard hitting defensive back Robbie Brindley. Brindley is what you would call James’ kryptonite or pretty close to it. I think Chris James and his Notre Dame Dons are going to have a good year, but they should circle the day when they play Nazareth on the Roadrunners Homecoming on their calendar because that is going to be a game for the ages. Weishar is a whopping 6-5 and 225 lbs. This tower of a receiver committed to Notre Dame but also got offers from Arkansas, Boston College, Cincinnati, Illinois, Indiana, Iowa, Kansas, Maryland, Michigan, Missouri, NorthCarolina State, Northwestern, Ohio State, Ole Miss, Purdue, Tennessee, Vanderbilt, Virginia Tech, and Wisconsin. Weishar has the height to catch over any defender and is like a recking ball when he is running to the end zone. 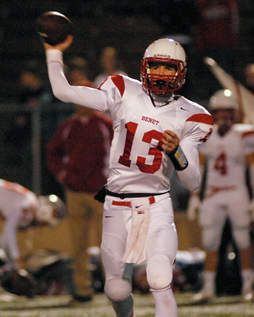 Weishar and the Marist Redhawks had a fantastic regular season but couldn’t live up to the hype in the playoffs by getting upset in the first round by Lyons Township also known as L.T. This team and their star player both choked in the big spotlight and I think the same thing could happen again this year. Will Colmery is one of the stars on the stingy Roadrunners defense. He will be on the first team conference and is probably the best defensive linemen in the conference. At 6’5”, 248 lbs. Colmery is a hard hitter and he can blow past any offensive linemen. He is a quarterback’s nightmare. He is the ideal pass rusher. Colmery currently has offers from Central Michigan, Colgate, Fordham and North Dakota. If you’re up against Colmery this season, you better be worried. Listed by Edgy Tim as a player to watch, Robbie Brindley earned All Area Honorable Mention last year as a junior CB. He had his best game against the two best players in the conference. His breakout game was against Joliet Catholic, where he knocked down the number one running back in the nation who is now on USC, Ty Isaac. He didn’t just take him down once, he took him down over and over again. His second best game was against Notre Dame, where he and his team let Chris James do absolutely nothing. Tackle after tackle, he was a machine. Going into the second half of play both teams completely changed their offensive game plan due to Brindley’s dominance on the outside. He was number 36 last year but if you want to spot him this year he will be wearing number 7. His play reminds me of all Pac-12 conference corner back for the Oregon Ducks Ifo Ekpre-Olomu. They both can hit extremely hard and they are ball hawks. This year Brindley will be playing on both sides of the ball adding another weapon for QB Jake Bartels. Brindley is only 5’8” but is all muscle and is one of the fastest players on the team. I think Robbie Brindley is going to have an even better year then last year. He is one of the reasons I think the Roadrunners have a chance to win the conference title. 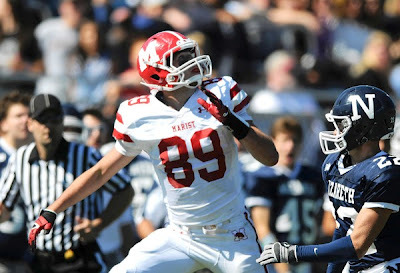 Flynn Nagel is the other superstar in the receiving squad for the Marist Red Hawks. Nagel is 6’0” and 180lbs. He can beat any defender on his first step, and then he is gone down the field for a long bomb deep ball touchdown. The play that kills defenses the most is the bubble screen. Just throw a short little screen pass to Nagel and next thing you know he is gone for an 80 yard touchdown. The key to this play is the quick foot work by Nagel, his juke move could even brake all star pro CB Richard Sherman’s ankles. Nagel has the footwork of a ballerina but trust me he is no wimp. He can shed tackle after tackle trucking over defenders. His play reminds me of Philadelphia Eagles wide receiver DeSean Jackson, they are both just explosive playmakers. Nagel has an offer from Illinois and he has gotten looks from Florida State, Indiana, Iowa, Michigan, Missouri, Notre Dame, and Stanford. This great athlete is the perfect Robin for Nic Weishar who is his Batman. Flynn Nagel’s talent gets over shadowed by Nic Weishar but he can sure play ball. Jack Beneventi was one of the reasons Benet Academy had one of the best seasons in school history last year. He started as a Sophomore and played like he was a last year Senior captain. If you could dream up the perfect pocket passer he is what it would look like. Beneventi is 6-6 and he is 185 lbs. He has great eyes and can see the whole field. He has a gun slinger mentality and has a one of the biggest arms in the conference. His accuracy is dead on and his game goes up in clutch moments. Beneventi can move around in the pocket and avoid defenders but one thing he is not the greatest at is throwing on the run. This is a weakness that he needs to improve on. He can be mobile but he is also smart and knows when to slide. That is big because he has to avoid injury, because if he goes down so does the Benet season. Next year I think will be his best but this year he will also shine. This young QB is taking the conference by storm. Last season he passed for 2,322 yards and threw 20 touchdowns. The sky is the limit is for Jack Beneventi. This is is going to be really exciting and I can’t wait for it all to begin. Look for me on the sidelines and bleachers. Hope to see you there too!